Happy Monday, and I hope you had a great weekend. It's raining and gloomy this morning, but I am thankful for the nice weather during the weekend. Today I would like to share with you how some of the lunches I made did not turn out looking how I wanted them to be. But hey, I've learned that as long as it is not school lunch, Nikolai doesn't mind at all. I don't always make cute lunches and many days the lunches that I packed did not make it to this blog, they may have been leftovers from dinner or some simple ones like these. Nikolai loves Asiago cheese and turtles, but I was in a hurry and decided to make roll-ups with a turtle cup and cupcake pick but these roll-ups did not turn out quite right. The cheese was too thick and was a challenge to roll. On the bright side, he came home with an almost empty lunch box except a few baby carrots. 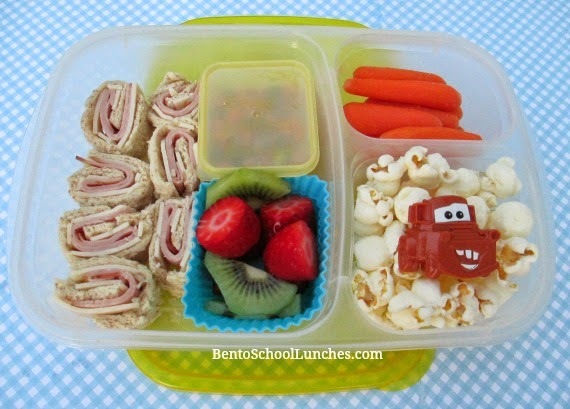 These simple lunches were packed in our Easylunchboxes container. 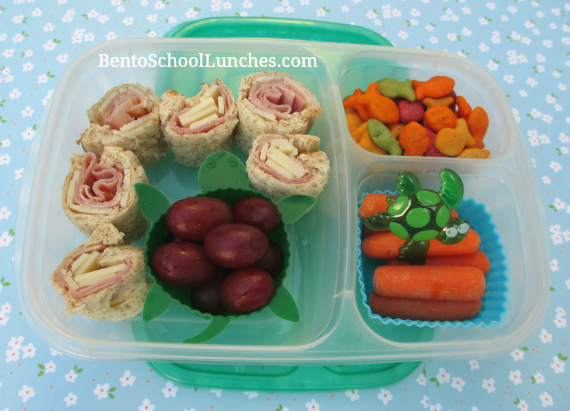 Main compartment: Roll-ups sandwiches and seedless red grapes in a turtle shaped silicone cup. (I always flatten the bread slightly with a rolling pin whenever I make roll-ups sandwiches). Here is another roll-ups lunch which took me less than 10 minutes to pack. Main compartment: Roll-ups sandwiches, organic kiwi and strawberry slices in a silicone cup. Chocolate covered sunflower seeds in the mini-dipper. Bottom right: Popcorn with a cupcake ring. Both look yummy! Love the turtle theme you used too! They both look so yummy, making me hungry before bedtime.